Born on 12th July 1952 as the son of a professional tangosinger, Aníbal Civilotti fled from his homecountry Argentina as a political persecutee in 1976. He studied composition in Barcelona and continued improving his guitar playing. During that time, he was a member of the Argentinian vocal ensemble „Canto de Cantares“. With them he toured Europe in 1978. After a Germany tour with the salsa group „Obatala“ in 1979, he settled in Germany and gained popularity in the Latin American music scene with appearances as a percussionist, guitarist and singer. 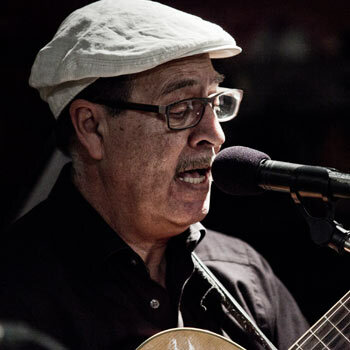 As a singer and bass player, Aníbal Civilotti founded the „Buenos Aires Tango Trio“ and played in different Latin American bands and studio productions. Aníbal Civilotti has been a member of Grupo Sal since 2004 and the more recent formation Grupo Sal Duo.